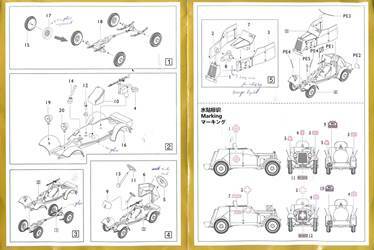 A preview of the pre-production version of this kit can be found here. Both vehicles were designed as reconnaissance vehicles based on a standard Adler 4x4 passenger car chassis mounted with a lightly armored open top body. 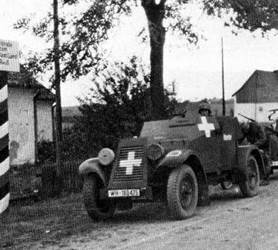 Maschinengewehrkraftwagen (Kfz.13) was armed with a single MG13 machine gun mounted behind the protective shield. Funkkraftwagen (Kfz.14) was fitted with long range radio equipment and frame antenna and served as a wireless radio car. Both were issued to Aufklärungs (reconnaissance) detachments from 1932 onwards and remained in service in limited numbers until 1941, taking part in both Polish and French Campaign. Both vehicles were not suited for combat but proved valuable for training purposes. Both vehicles were interim solutions with passenger car origin and its poor cross-country performance. 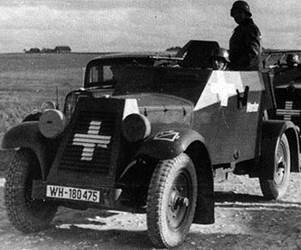 From 1932 to 1934, Daimler-Benz produced only 147 Kfz.13 and 40 Kfz.14 on chassis supplied by Adlerwerke. Armor bodies were produced by Deutsche Edelstahlwerke AG in Hannover-Linden." 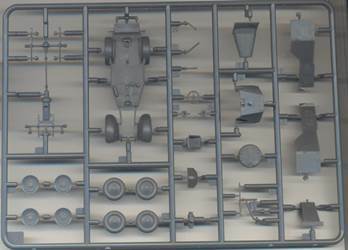 It seems that two types of wheels existed and at least two types of tyres, as can be seen in the pictures below. 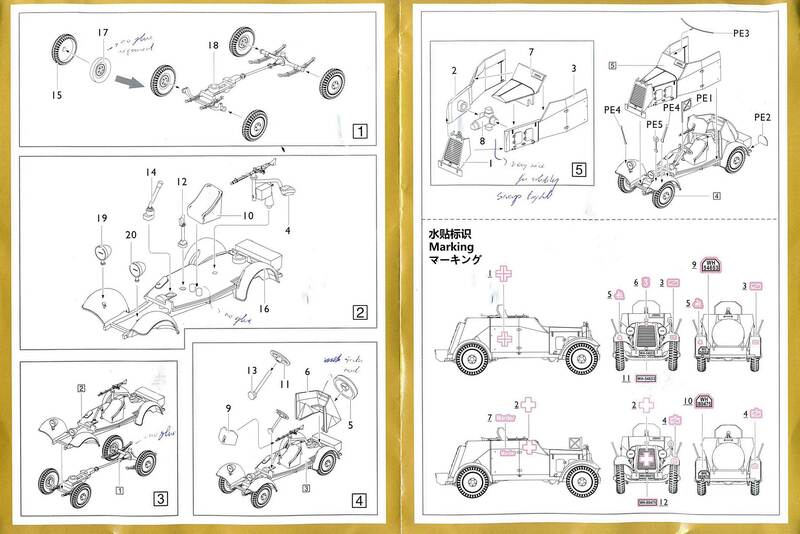 Note that the kit doesn't match either wheel exactly, while the thread pattern matches the top picture best. It is actually not surprising to see differences between individual Kfz.13, as it seems they were built on two distinct chassis, one by Daimler-Benz and one by Adler . Dimensions between both were slightly different. Little seems to have been changed with respect to the pre-production kit, except for the addition of a PE fret and the decals. Note that there are two identical kits included in one box. 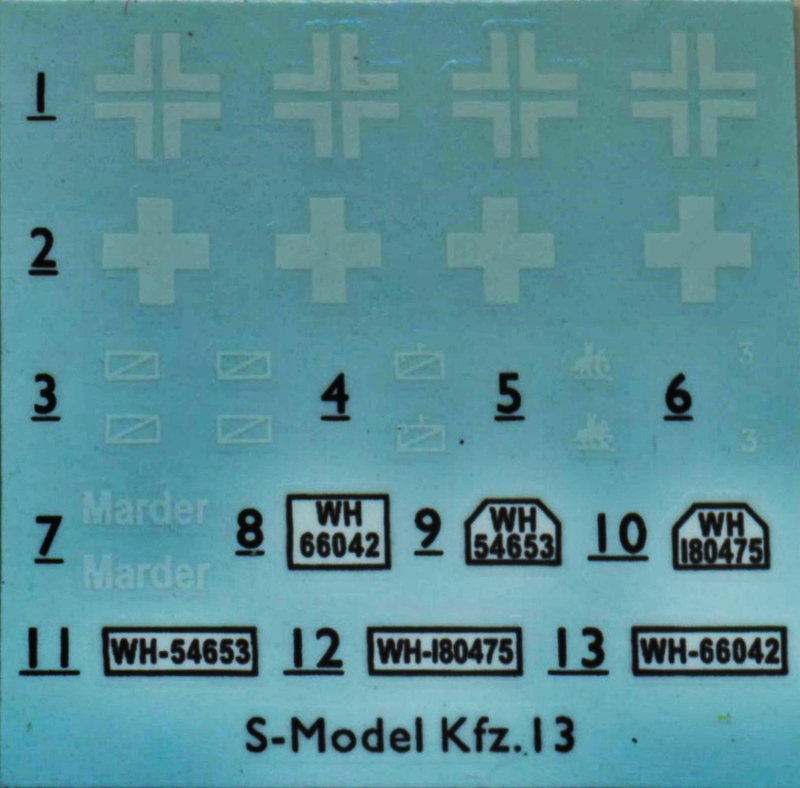 Note that the PE fret is labeled "Kfz.13/14". 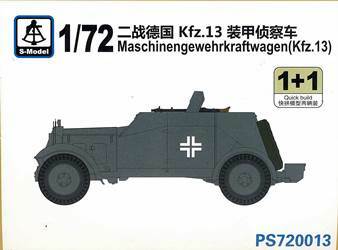 Might we expect a Kfz.14 soon ? The instructions are clear and simple. Markings are given for two vehicles, both to be painted dark grey all over. - A vehicle from an unidentified unit. Judging from the style of Balkenkreuz, it must be from after the Polish campaign. Our own Al Magnus adds that the horse decal would indicate 1 Kav.Div. - "Marder" from an unidentified unit. Judging from the style of Balkenkreuz, it must be from the Polish campaign and is probably the vehicle in the picture below. If so the most likely colors would be 2/3 gre, 1/3 brown. The suspension is very nicely detailed, but very delicate. Not what you would expect when you hear that the S-Model kits are labeled as "wargame" material and actually better than what is found in most mainstream plastic kits. The wheels have an insert on the backside permitting detail on both sides (something another Chinese manufacturer seems to leave out); this insert doesn't require glue. The MG (which actually resembles the MG34 more than the MG13 and - strangely - only has detail on the left side of the gun barrel) has an integral pedestal. I chose to add a backrest to the seat. I am not sure if this is entirely correct, but I have seen it on other models. I beveled the MG shield at the edges to give it a better scale appearance. 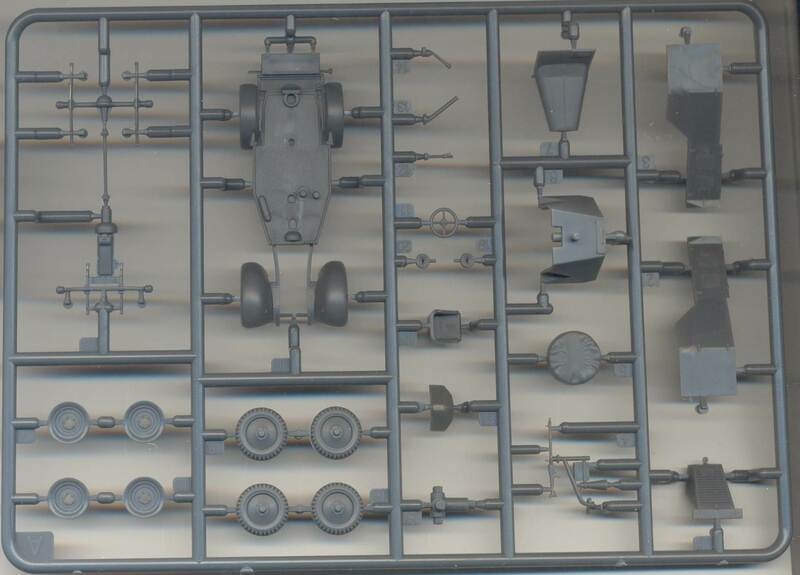 Furthermore, a fire extinguisher was added to the right side of the driver and a box to the right of the gunner, both from the spares box. I believe the fire extinguisher came from the CMK set. Modelers with a more bellicose nature might want to add some ammo to the MG, which is not included. The way the nose armor goes together is innovative. S-model gives a 5-pointed element to which the panels attach, making the construction a lot less fiddly than it might have been. Note that S-model only gives the armored nose, but not the grille that went behind it. Little of it could be seen on the real vehicle, but still. The small circular plate (with the manufacturer's logo) is a fragile element, which I easily managed to break and feed to the carpet monster. I improved this assembly by engraving the driver's visor on the inside, adding a dashboard, engraving the hinge line for the doors and adding weld beads (which I believe I grossly overdid, actually). Due to the way the kit is engineered, the doors are easy to open after minor surgery. Before adding the weld beads and hinge line. The rear armor also received weld beads and the ejector mark on the inside was smoothed. A stowage plate was added. After adding the weld beads and hinge line. Major omissions in the kit are the boxes on the outside of the vehicle: two on the rear armor and one on the right door. (Incidentally these are also missing in the 1/48 WSW kit.) These boxes were sourced in resp. 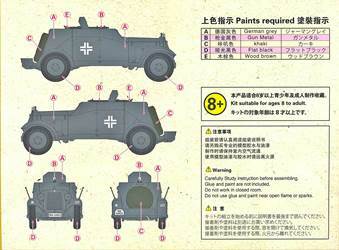 the ACE kit of the Kfz.13 and the spares box. Minor omissions are the turn indicators on the doors and the dashboard, which I made from sheet plastic and a punch-and-die set. S-model gives two different styles of rear licence plates. I believe the square one is the early type and the beveled one the later type. 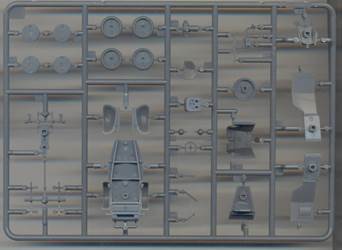 PE parts for the width indicators and the rear view mirror are given. While it is nice to have them, the flatness of the PE parts doesn't do them justice. Adding insult to injury, there are no locating points on the fenders for them, and you are supposed to glue the knife thin edge to the (curved) plastic parts. This is bound to end up in a very weak joint. I decided to drill holes in the fenders to give the PE parts some grip. In the end I made the width indicators from scratch. Bent PE width indicators and underside detail. 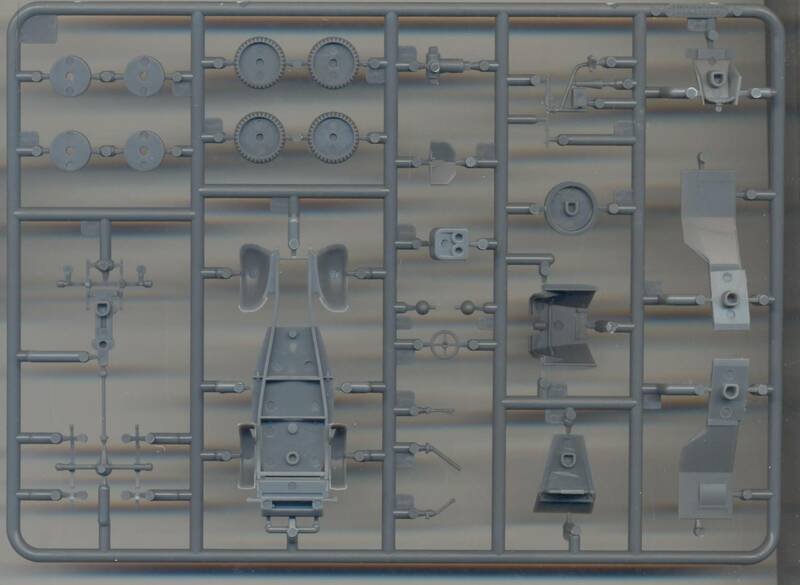 After I finished the model, I noticed that there is a see-through effect at the position where the shaft for the steering wheel enters the engine compartment. If I had caught it earlier, it would have been an easy fix to attach a scrap of plasticard. After almost finishing the model it was a lot harder. I decided to paint the vehicle in a pre-war Reichswehr Buntfarbenanstrich, which is not unlike the late war three-color camo. Disaster struck when masking, as my Maskol decided to go medieval on me and turn to a sticky, almost irremovable goo, instead of a thin easily peeled off film. During painting I noted that the ridge between the tyres and the wheel rims might have been more pronounced to ease painting, while the front fenders always get in the way. As the kit only comes with WH licence plates, I had some custom-made RW decals printed by Aleran to finish this kit off. A comparison with the First to Fight kit can be found here. I omitted the MG and replaced it with an extra seat (from the spare's box) and three radios on a shelf. The latter were made from plastic rods and the faces from the NH Detail PE set. The NH Detail PE set was also used to enhance the headlights and front licence plate. Some extra interior bits were added based on pictures found in . 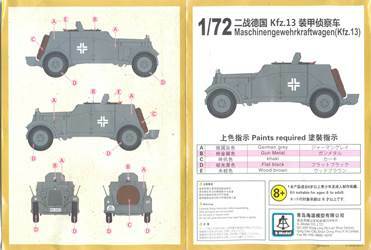 This time the missing boxes on the outside came from the First to Fight Kfz.13. The spare tire was covered in paper tissue drenched in white glue for a better texture. 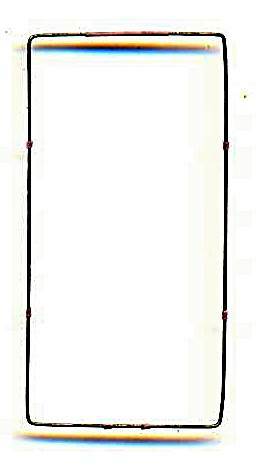 The antenna was made from steel wire and stretched Q-tip shafts. The headphone is metal foil and punched plastic disks. Wires are copper from an electricity cable. 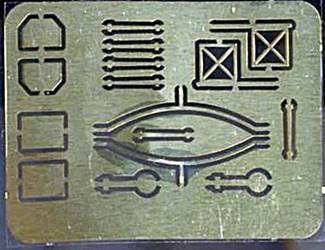 Width indicators are insect pins, cut to length. The disc on the engine grille (because I broke the original). The map is from Unicorn. I think I actually used a map from the "Russia" set, while I plan on using the kit in a "France" diorama. I just hope most modelers won't be able to tell. 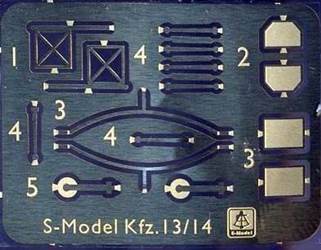 tactical insignia from the ACE Kfz.14 kit. While not related to the model, I noticed that the ICM divisional insignia decals were impervious to my usual setting solution (Micro Sol), so I resorted to some more drastic measures. (Before you read on: don't try this at home !). I gently moistened the edges of the decal with a fine paintbrush dipped in acetone. This softens the decal film so it becomes as good as invisible and adheres perfectly. For the record: if you use just a smidgen too much the printed insignia will become invisible as well, so in case you didn't heed my warning: err on the side of caution. In the pictures below the model still needs some weathering, which I will apply when I finish the diorama allowing a good match in colors between the dust in the scene. The wheels are pressed on without glue (and will easily stay put like that), allowing easy removal for the weathering phase. Review sample kindly purchased by author.